The POLECAM IPAD/TABLET MOUNT was created for a specific shoot whereby locating an iPad within the operator reach without compromising rig operation was critical. The system is adjustable and enables the operator to locate their iPad/tablet to any typical control position. 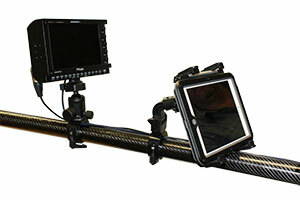 Polecam iPad mount is available for GBP195. Seen here with the iPad mini mounted in a Peli Vault (not included). 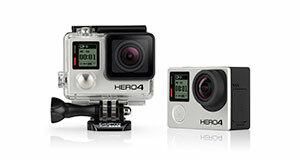 Need to shoot useable 4K footage on the move? 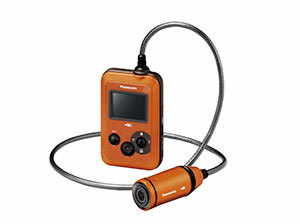 The new PANASONIC HX-A500 wearable action camera gives 4k at 25fps plus 1920 x 1080 footage at 50fps and 848 x 480 at 200fps. It comes with all manner of accessories for mounting and has good low light qualities we found after testing at IBC. TALKSHOW VS-100 is a video calling production system from Newtek designed for television studios and live event producers. Released at IBC is transforms every Skype video call with higher video and audio quality to deliver a great production to your audience.